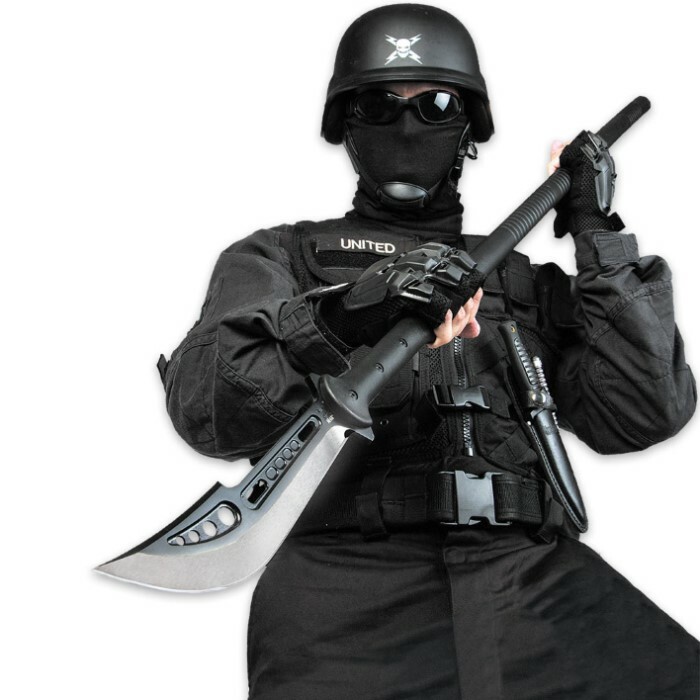 This advanced combat naginata pole arm brings innovation to the personal defense world in a big way, combining the traditional attributes of a naginata with a modern, tactical approach. 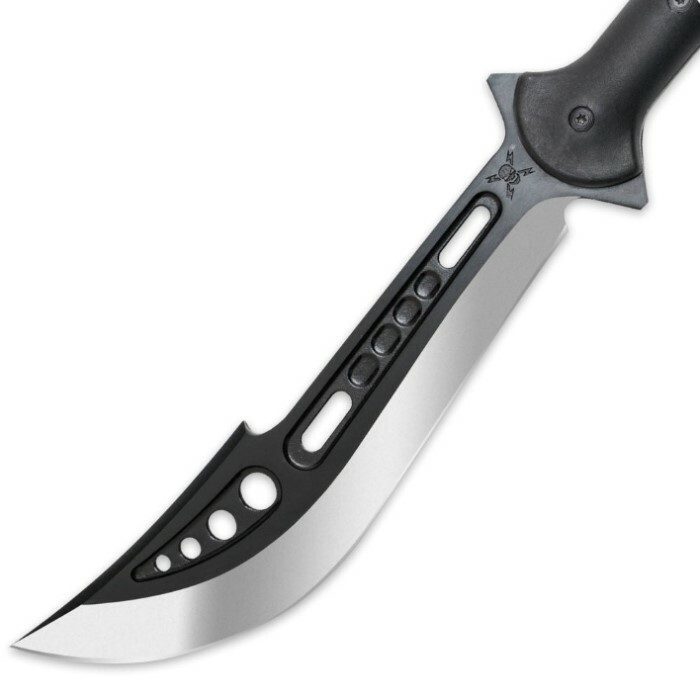 The massive, thick 10-inch blade features tempered 2Cr13 stainless steel construction with a heat-treated oxidized hard coat finish for a non-reflective appearance. The hefty shaft is made of a virtually indestructible combination of fiberglass and reinforced nylon for strength and durability, and sculpted finger notches provide a fierce fighting grip at all times. 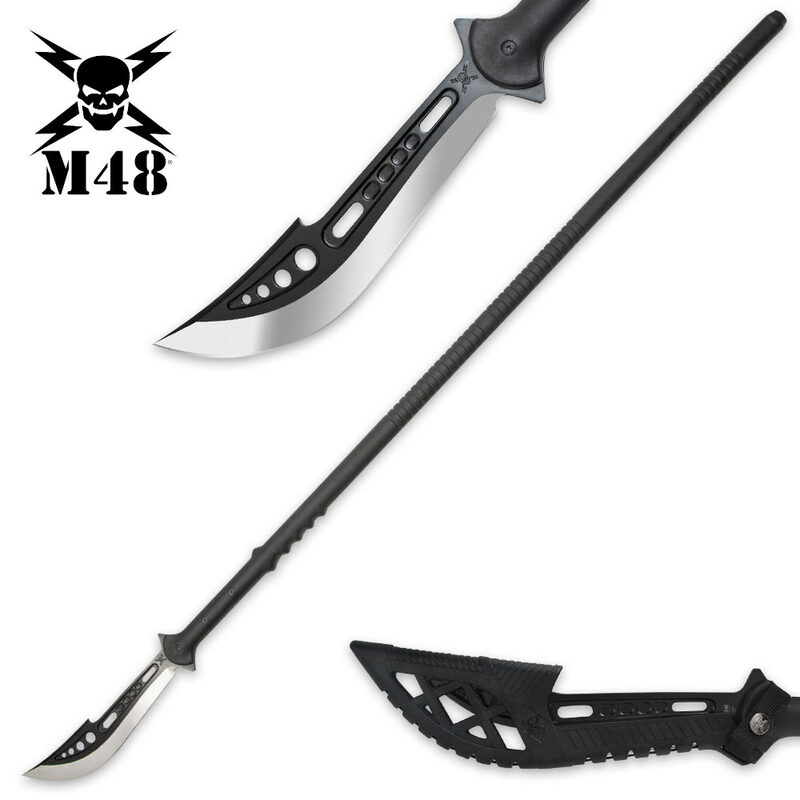 It offers extended reach and powerful thrusting potential at 57.5” in overall length. I bought this because of a wild pig problem on our land and I can say this naginata was a great buy. Indestructible and sharp. It takes some practice if you are used to either a sword or a spear, it is used like neither really. Great product and my hats off to Budk for carrying it. This isn't a wall hanger but a functional weapon. I was very surprised to see the blade was sharp and as durable as advertised. My favorite thing about it is the well designed sheath and the two hand grips. The way the hand grip can ergonomically hold you in a thrusting position with a lot of the balance point in your thumb makes it feel like the polearm is it should be. I enjoyed it a lot and recommend it to any martial practitioner. Alright, I have been eye screwing this Naginata for quite some time now. I am amazed at how great of quality this thing really is. It has an extremely log reach, and it does what you need it to do. The reason I chose this spear vs the traditional spear is this one is more catered toward a slashing mindset vs just peer thrusting mindset. You are still able to thrust and throw the spear, but the way the blade is shaped makes for a better combination of actual moves you can do with it. This Naginata is extremely lightweight too, making it very easy to maneuver when using it. 5 stars. Get one. Once again, Budk delivered a great product. My husband had been eyeing the M48 Naginata Polearm With Sheath for quite some time so when it went on a closeout price I started waiting for just the right coupon on top of that. This is a solid piece with great construction. The blade was oiled, clean, and sharp. The handgrips all fit perfectly for him based on his size and comfort. His height is 5' 9 1/2" with a small to medium frame by the way for those who buy products based on their own body size/height. Overall, he was very, very happy with this purchase. Thank you again Budk. This is simply beautiful. It slices, it dices, it pierces, and it chops. It's a perfect fit for my size. Also, it can be thrown like a spear and do some damage. I love almost everything about this naginata except I think the shaft should have been made longer. I have several naginatas in my collection and this one seems smaller by a foot. Not to big an issue but I would perfer a longer shaft on this weapon. Overall the blade is sharp, nice weight, and the price is good. Goes great in my collection. This item is very high quality. Very Sharp, Perfect for defense. I own most all M48 items, this may be the best of them all so far. Exactly what I have been looking for. This is my third purchase from Trueswords and I'm definitely satisfied with it. This naginata is SHARP. and it feels very durable too. It has a good grip and just overall is awesome. I thought it would be a little bigger but that's alright. Still a fantastic buy.